The territory of modern Kenya became a colony in 1885, when Germany established a protectorate over the over the Sultan of Zanzibar's coastal possessions. In 1890, Germany ceded its coastal territories to Britain. The active struggle for the independence of Kenya began in 1952 with the Mau Mau Uprising. It was an armed movement against the European settlers and the colonial government. The uprising was suppressed in 1956, but it brought substantial changes. In 1957, native Kenyans were elected to the Legislative Council for the first time. 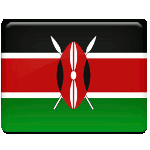 On June 1, 1963, Kenya attained internal self-rule. The anniversary of this event is celebrated as Madaraka Day. The world “madaraka” can be translated from Swahili as “obligation” or “liability”. The main celebration of Madaraka Day is held at Nyayo National Stadium in Nairobi. It includes President's speech, a parade and a concert. Many people celebrate the holiday with family picnics in public parks. Madaraka Day is a non-working holiday, so government offices and banks are closed as well as many (but not all) businesses.